The last road trip had arrived. Had a sort of metallic taste in my mouth today. Maybe that goat I ate yesterday is coming for its revenge. Tanzania was the last country bordering Rwanda I had not yet fearfully stretched my toe into before running away in fear. Let's do it. I came to the realization that Rwanda is nicer than most of the Caribbean and Central/South America in terms of cleanliness and feeling safe. Kayitare pointed at a mass of white tents in the distance. "You see there? Those are the tents of Burundian refugees." Kids learn to carry water at a young age in Rwanda. I saw toddlers carrying smaller jugs of water next to their mothers with giant yellow jerrycans on their heads. Speaking of which, we finally hit someone. People just saunter onto the highway like they don't know how a fast moving vehicle will ruin their day. I don't think we hit his actual body but we hit the jerrycan he was carrying so hard that it popped in the car's retractable side-view window. He didn't stop. I could tell that Tanzania was a more robust economy just from the number of cars headed that direction. There was lots of NGO and safari-looking vehicle traffic. What passes for an ambulance having an emergency around here is a white jeep with its blinkers on honking wildly. Strangely enough people rarely ask us for a ride. In Gambia it was every single person we passed would ask it seemed. You want to feel bad about yourself? Drive past 100s of people carrying heavy life necessities on their heads while in a van that seats 8 with only 2 people passengers. I've probably driven more miles on Rwandan roads that most of the people who live here. One lady had a whole mattress on her head. I'm obviously fascinated with the whole carrying of things on one's head. Kayitare probably thinks I'm a crazy person. It would be sort of like if he came to the US and just took thousands of pictures of people loading their groceries into their cars in a Target parking lot. We drove past some kids and they rolled some little green balls onto the street in front of our car. I'm not really sure what that was about even after Kayitare's explanation. I'm going to say that they were nuts that the kids wanted cracked. People with laden bicycles look sad going up the hill but flying down the hill on the other side full of bananas looks kind of fun. Kayitare calls a pee break a "short call". It took me forever to figure out what he was saying. It got so bad that I knew the mumbled phrase meant "stop to go to the bathroom" but I still couldn't make out the words. That was a fun bit of African English. When we arrived at the Tanzanian border I was really surprised at how developed it was. There were large, new immigration buildings on both sides of the line. 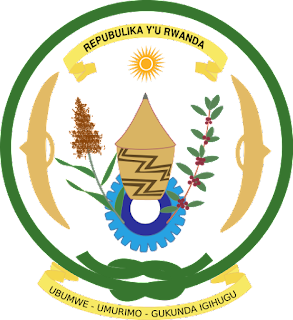 We just drove past the Rwandan one, which made me a little uncomfortable because now we didn't have an official exit stamp. There was a river of trucks crossing the border, many of them carrying fuel. I guess now we know where Rwanda imports its gasoline from. The actual border was a river, and upon crossing the bridge we once again switched sides of the road. Tanzania is another left side country. When we arrived at the Tanzanian side of the border there was an identical immigration building that we entered. We first popped into a room that was empty except for a few chairs with policemen sitting in them. I had a nice little ambassadadorial chat with them. "My name is John, I am from America, nice to meet you", etc. etc. The guy in charge even asked me what I thought of the border and if I had any suggestions to make it better. I didn't but I came up with some crap about how the border seemed to be full of commerce between the two nations something something. He either didn't understand me or just was not impressed. Whatever dude. We then moved over to the immigration window. Kayitare yet again did his best to hustle a passport stamp out of the immigration lady. She proceeded to lecture/scold me about not having gone through the proper procedures. If I wanted to enter I needed to first go back to Rwanda to get the exit stamp, then I needed to fill out some paperwork, then pay a $100 visa fee. She seemed insulted when she asked how long I wanted to stay in Tanzania and my reply was "5 minutes". The thing is the border was the river we had just crossed, so I was in the odd predicament of already standing in a country that I did not have permission to enter. She started on this lecture about how all borders have rules and this one was no different blah, blah. Of all people lecturing me about how borders work is pretty rich but ok lady. Have yourself a good day. After Officer Powertrip was done with her speech we left the office and I walked toward a sign that said "Tanzania" on it for a quick pic. I hadn't made it over when a random man ran over and told us that Powertrip wanted to talk to us again. Ok, cool. Maybe she had cooled down and wanted to try to patch up her poor first impression. Nope. She said something like "you are not welcome here, get in your car right now and leave". A thousand ebolas upon you. While driving we passed a brightly painted bar named "hakuna matata" which of course made me bust up laughing. I asked Kayitare what's the deal with hakuna matata and he turned to me and deadpanned "it means no worries", in Swahili. More laughing. I asked him if he had ever seen Lion King and he had no idea what I was talking about. In the middle of nowhere we passed some sort of support for women NGO craft shop. I just thought that I should do my part to support women so that they can support themselves and their families and other good things that good people say. Also I figured that since we were out in the sticks that the prices here would be low. But mostly all of that first stuff that I wrote. The pointy basket things are called agaseke. I guess they are traditionally made out of the hemp-like fiber of the sisal plant which is a type of agave. I read an article about them in the East African here which says the price of sisal has risen so some women have resorted to weaving the baskets out of discarded plastic shopping bags. They are used to present people with important gifts. 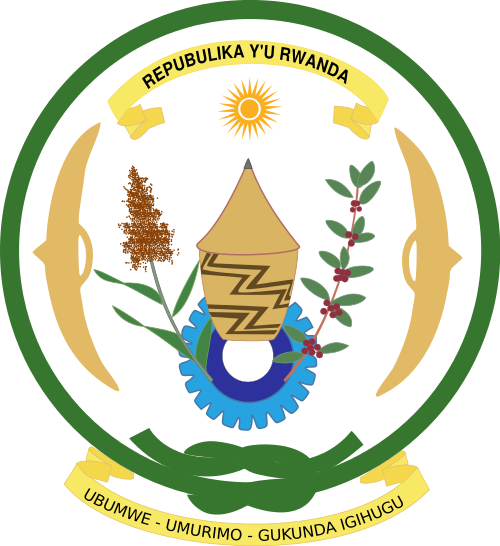 The agaseke is prominently displayed on the seal of Rwanda. I felt vindicated in my decision to stop here when Kayitare even bought a purse for his girlfriend. My low price theory was correct! I'm a bad, bad man. While I was shopping a little girl kept yelling "good morning!" at me from across the street. I waved and returned the greeting. What I was really thinking though was more like little girl, it's 2pm. Get a job. One pair of earrings I bought were bird shaped and I asked the shop woman what the bird was called. They were shaped kind of like dodos, so when the lady replied "inkoko" I was excited that I had made a discovery and I couldn't wait to look it up once I got internet access. In Kinyarwanda, one of the national languages of Rwanda, inkoko means chicken. Kayitare knew that I was leaving the country tomorrow so he wanted to stop at another place along the road for a beer. The tusks on this place reminded me of the Flintstones. Kayitare and I have been together now for like solid days, and a funny thing happened. I think we may have become actual friends. He showed me pictures of his loved ones and we talked about life. He asked about the body type of my family members. He continued that Americans are big and Europeans are small. Of course I had to ask him which of those I am and he said not big but strong. Correct answer sir. He was messing around on Youtube on his cellphone and I couldn't resist showing him my Cardinals interview video. Here we are, at a rural roadside Rwandan bar, watching a video shot in St. Louis weeks ago on a phone pulling said video out of signals flying through the air. What a time to be alive. While watching he asked if I was on the team. I couldn't tell if he was joking or not. I then followed up with the Hakuna Matata music video. He looked at me unimpressed and was like "is this the kind of movies you like?" Hey, don't try to make me look like the weird one here mister "I don't know who Walt Disney is". I guess I'll leave this here in case you want to get into the African mood. They had the same chewy goat bit skewers as yesterday but I managed to successfully decline the offer this time. I've cheated the gods of gastric distress enough on this trip I think. While seated at the bar I can hear people snoring, construction, babies crying, and roosters crowing. There seems to be a pattern in this country where an establishment will have all just normal seating, except for one set of the Africanest Africa chairs that have ever been assembled. While I didn't see much of the countries that we drove to I saw a ton of Rwanda.